Poroshenko requested several state agencies to seek NATO's help in demining works in the town of Balakliya in the Kharkiv region. KIEV (Sputnik) — Ukrainian President Petro Poroshenko on Thursday requested several state agencies to seek NATO's help in demining works in the town of Balakliya in the Kharkiv region where a munitions depot caught fire. A fire broke out overnight, triggering detonations and prompting evacuation of 15,000 residents. 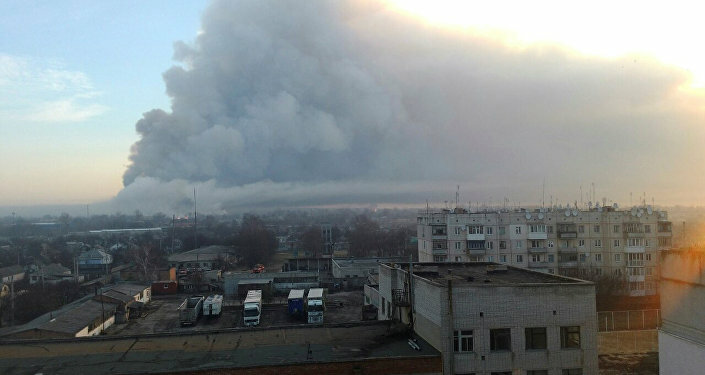 Defense Minister Stepan Poltorak said they were considering sabotage as a possible cause of the blaze. "Gave an urgent instruction to the Foreign, Defense Ministries, State Emergency Service to seek NATO’s help in humanitarian demining in Balakliya," Poroshenko wrote on Twitter. According to the Ukrainian authorities, about 138,000 metric tons of ammunition were stored in the depot. Two people have been reportedly injured.